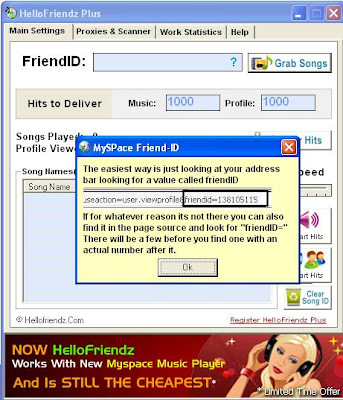 Well, after much fight over the issue, of MySpace changing its flash player to a New One, HelloFriendz have once again updated their software to be compatible with the recent MySPace Player. The WAIT IS OVER. 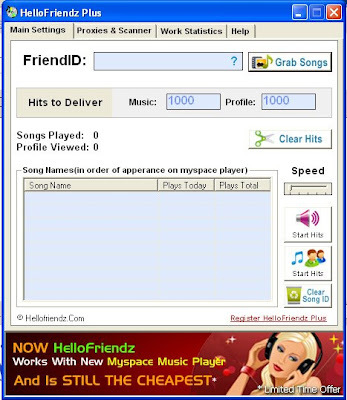 Compatible with the New Music Player of Myspace, and with the cheapest price, Hellofriendz are again back with a BANG! With Complete New and Improved look, with effortless Proxy scanner and Proxy adder facility, that will give your Myspace Music profile the boost you always wanted! With More than 1000 satisfied customers within 2 months, Hellofriendz are here to give the customer the best product in the Industry and support, that no-body thought would be possible.